This article is the city in GTA 1. For the state in GTA San Andreas see San Andreas in GTA III Era. San Andreas is a city in Grand Theft Auto 1 based on San Francisco, California. The city is unlocked upon completion of the second string of Liberty City missions. 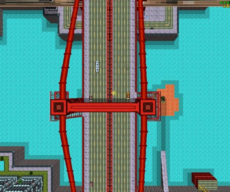 The large red bridge of San Andreas. 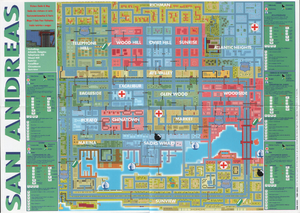 Similar to other cities in GTA 1, San Andreas is designed as a coastal city, although the city lacks adherence to San Francisco's layout of districts, as outlying districts are not accurately placed and the city in entirety faces the wrong direction. The city is divided into two landmasses, with the northern portion the largest of the two and serving as the city's core, while the southern portion is occupied by a single district, Sunview. The northern landmass is further divided by Aye Valley, which cuts through the heart of the area from the east to the west. The southern coastline of the northern landmass is characterized by its many docks, similar to San Francisco's docks to the north and east of the peninsular. San Andreas sports distinctive features associated with San Francisco, such as sloped districts, tram lines (which appear only for show), Chinatown and "Soviet Hill" (Russian Hill) districts, Lombard Street, and a large red bridge attempting to emulate the Golden Gate Bridge. Accessible trams, similar to train systems in Liberty City and Vice City, were considered early during the game's development, but was not finalized, possibly explaining the absence of train services in San Andreas. The city is apparently named after the fault line that runs along the state of California, where San Fransisco is situated. Alternate rendering of San Andreas (PlayStation 1). This page was last modified on 3 August 2012, at 19:27.